As much as I love tulle skirts and sequins, sometimes I think the best looks for the holidays are the understated, less traditional looks. 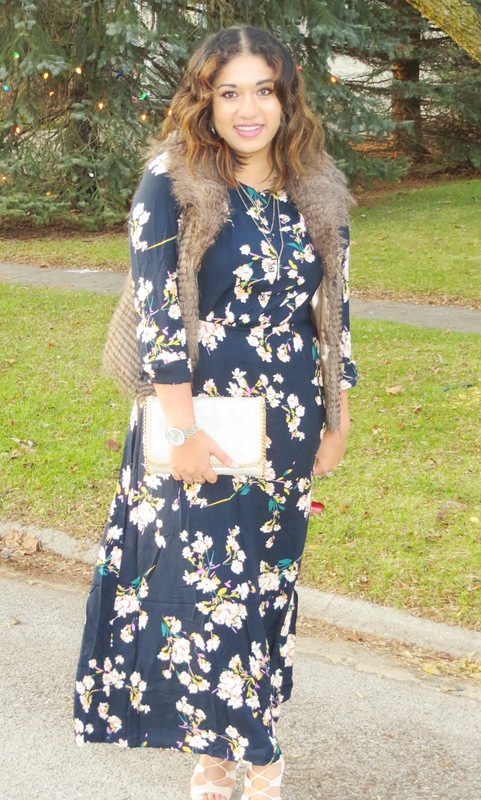 This floral maxi paired with a faux fur vest fit that bill for me. Add in some lace-up heels and a fun clutch, and I had a look that was party-ready without being too obvious. I wore this look to a holiday party at home with my girlfriends and I got so many compliments on the dress and vest. 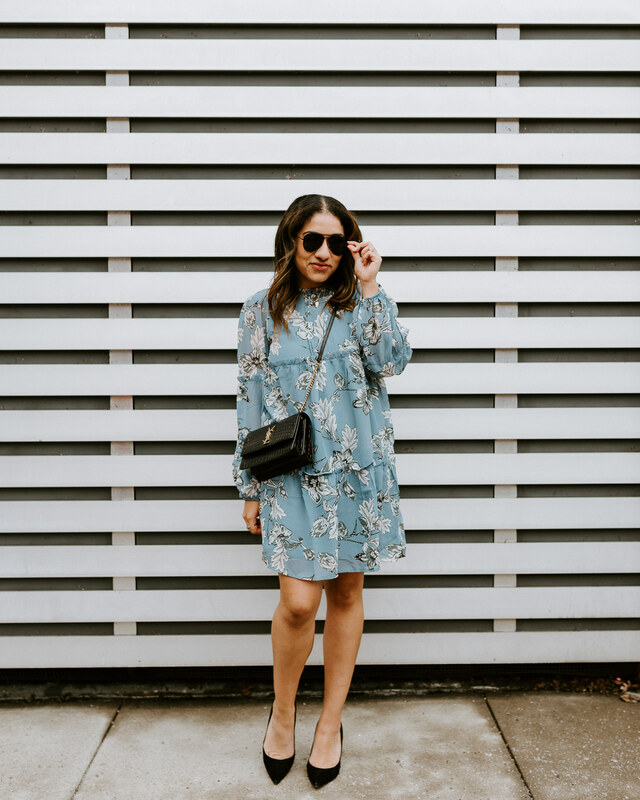 This dress is a steal at under $25 and so comfy. I rolled the sleeves up but they can be worn unrolled, as well. How do you dress for the holidays in new and different ways? This whole outfit is divine! You look fantastic lady. I am such a fauz fur vest lover! This one is pretty amazing! LOVE LOVE LOVE the faux fur vest. Anything faux fur is so festive and fun! Thanks lady! And this one is so affordable! gorgeous outfit girl!! loving the fur with the dress! Love how you layered that fur over your dress! Great way to transition through the season! Thank you!! It definitely is! I love this! I wore something similar for Thanksgiving and it was perfect. That dress is so pretty! I love that you paired it with the faux fur! personally, I feel like adding fur to anything instantly makes it holiday-esque, whether or not it is traditional! love it. Totally agree that sometimes the best holiday looks are a little less flashy! I love this maxi! Adding the fur vest was all you needed to make the look holiday ready! Who says you have to wear red and bedazzles!? Such a cute look! I love that dress, it's so pretty! Love this! Its refreshing to see something other than sequins!! What a great way to mix things up! This dress is so cute! Love long floral maxi dresses, great look! Oh heeeeeey, vest! So glad you gave it a loving closet 😉 Looks great on you! Very cute maxi dress! Looks great with the fur vest too! SO very pretty and definitely unique for a holiday party, which I LOVE!